Here’s the (pretty abhorrent) front cover of yesterday’s Sun newspaper. Bearing in mind that several recent terrorist atrocities are top of everyone’s mind at the moment, it’s clear what the Sun is implying here. Nearly one in five British Muslims have some sympathy with those who have fled the UK to fight for IS in Syria. The implication is obviously a starkly ominous claim that 20% of Britain’s Muslims support the sort of sick action that IS have claimed responsibility for in Paris and other places that have experienced horrific, crazed, assaults in recent times. This is pushed even more fervently by the choice to illustrate the article solely with a photo of Jihadi John, an inexcusably evil IS follower “famous” for carrying out sick, cruel, awful beheadings on various videos. Given the fact that – most thankfully – there are far, far fewer people featuring on videos of beheadings than there are people travelling to Syria to join fighters, this is clearly not a representative or randomly chosen photo. It beggars belief that there are such high numbers saying that they agree with what these scumbags are doing in Syria. We’ve all seen the pictures of how innocent Yazidi girls are treated, how homosexuals are thrown off tall buildings. It’s utterly abhorrent. The behaviours she describes are undoubtedly beyond abhorrent. But of course, this 1 in 5 statistic isn’t true – even in the context of the small amount of data that they have used to support this story. It is however a very dangerous claim to make in the current climate, where “Islamophobia” and other out-group prejudices make the lives of some people that follow Islam – or even look like a stereotype of someone that might – criminally unpleasant. Britain does have statutes that cover the topic of hate speech after all, and hate speech can come from many quarters. Anyway, enough of the rants (kind of) and onto the statistics. The survey this headline is based on did not ask the question that the paper implies. The paper deliberately misleads its readers by failing to give easily-available statistical context to the figures. The methodology used to select respondents for the survey was anyway so inadequate that it’s not possible to tell how representative the results are. The Sun’s claim that 1 in 5 British Muslims have sympathy for Jihadis (the headline) and those who fight for IS (in main text) comes from a survey they commissioned, which was executed by professional polling company Survation. You can read a summarised version of the quantitative results here. The “20% sympathise with Isis” and those implications are based on responses to question 6 (page 9 of the PDF results above), which asked people to say which of a set of sentences they agreed with the most. The sentences were of the form “I have a [lot/some/no] of sympathy with young Muslims who leave the UK to join fighters in Syria”. Results were as follows, and the Sun presumably added up the first 2 boxes to get to their 20%, which isn’t a bad approximation. Note though that an equally legitimate headline would have been “95% of Muslim respondents do not have a lot of sympathy for jihadis”. However, compare the claim that they have sympathy with those ‘who have fled the UK to fight for IS’ and ‘they agree with what these scumbags are doing…homosexuals thrown off tall buildings’ (even ignoring the implications of supporting the sort of criminal mass murder seen in Paris) with the question actually asked. There was no mention of IS or any particular act of terrorism or crime against human rights in the question whatsoever. The question asks about joining fighters in Syria. Wikipedia has a list of the armed groups involved in the Syrian war. At the time of writing, they have been segmented into 4 groups: the Syrian Arab Republic and allies; the Syrian Opposition + al-Qaeda network and allies; the Kurnodish self-administration and allies; and ISIL (aka IS) and allies. There are perhaps in the order of 200 sub-groups (including supporters, divisions, allies etc.) within those divisions, of which the huge majority are not affiliated with IS. Even the UK is in the “non-lethal” list, having donated a few million to the Syrian opposition groups. To be fair, the question did ask about joining fighters rather than the c. 11 non-lethal groups. But we should note that – as well as the highly examined stream of people apparently mesmerised by evildoers to the extent of travelling to fight with them – there was also a Channel 4 documentary a few months ago showing a different example of this. In it, we saw 3 former British soldiers who had decided to travel to Syria and join fighters – the ones who fight against IS. I do not know what religion, if any, those 3 soldiers followed – but is it possible someone might feel a little sympathy towards the likes of them? It is not necessarily a good thing for a someone to be travelling abroad to join any of these groups with a view to violent conflict, and I am convinced that some people do travel to join the most abhorrent of groups. But, the point is that, despite what the Sun wrote, the question did not mention IS or any of their evil tactics, and could have in theory suggested some sort of allegiance to very many other military-esque groups. The question only asks whether the respondent has sympathy for these young Muslims who travel abroad. To have sympathy for someone does not mean that you agree with the aims or tactics of the people they are persuaded to go and meet. One can quite easily imagine a situation where, even if you believe these people are travelling to Syria specifically to become human weapons trying to mass target innocent victims you can have some sympathy for the young person involved. It seems plausible to have some sympathy for a person that has been brainwashed, misguided, preyed on by evildoers and feels that they have such quality of life that the best option for their future is to go and join a group of fighters in a very troubled country. Their decisions may be absurd, perhaps they may even end up involved in some sick, awful, criminal act for which no excuses could possibly apply – but you could have some sympathy for a person being recruited to a twisted and deadly cause, whilst virulently disagreeing with the ideology and actions of a criminal group that tries to attract them. And, guess what, the Sun handily left out some statistics that might suggest that is some of what is happening. For every such survey that concentrates on the responses of a particular population, it’s always important to measure the base rate, or a control group rate. Otherwise, how do you know whether the population you are concentrating on is different from any other population? It’s very rare that any number is meaningful without some comparative context. As it happens, a few months ago, the same survey group did a survey on behalf of Sky News that asked the same question to non-Muslims. The results can be seen here, on page 8, question 5, reproduced below. So, 14% of non-Muslims respond that they have a lot or some sympathy with this group of travellers. Or as the Sun might headline it: “1 in 7 Brit non-Muslims sympathy for jihadis” (just below the same picture of a lady in a bikini, obviously). 14% is less than 20% of course – but without showing the base rate the reader is left to assume that 20% is “20% compared to zero” which is not the case. Furthermore in some segments of the surveyed population, the sympathy rates in non-Muslims are higher than in Muslims. The number among young Muslims aged 18-34 is even higher at one in four. Here’s the relevant figures for that age segment from a) the poll taken to support the Sun’s story, and b) the one that asked the same question to non-Muslims. So-called “Jihadi sympathisers” aged 18-34 make up a total of 24.5% of Muslims, and 30.1% of non-Muslims. A similar phenomenen can be seen when broken down by non-Islamic religions. Although some of these figures are masked due to small samples, one can infer from the non-Muslim survey that a greater than 20% proportion of the sample that classified themselves as some religion outside of Christian, Muslim and “not religious” were at least somewhat sympathetic to these young Muslims who go to Syria. Totting up the support for having some/a lot of sympathy for the young Muslims leaving the UK for Syria, we see that the proportion showing any form of sympathy fell from 27.9% in March to 19.8% now in November. That’s a relatively sizeable fall, again not mentioned in the Sun’s article (because that would spoil the point they’re trying to make the reader conclude). Here’s another headline I’ll donate to the writers: ‘Dramatic 30% fall in Brit Muslims sympathy for jihadis‘. Next up, time to talk about the method behind the latest survey. it could not be confident that it could accurately represent the British Muslim population within the timeframe and budget set by the paper. So rather than up the timeframe or the budget, the Sun went elsewhere to someone that would do it cheaper and quicker. Survation apparently complied. Given most surveys cannot ask questions to every single person alive, there’s a complex science behind selecting who should be asked and how to process the results to make it representative of what is claimed. Here’s the World Bank on how to pick respondents for a household survey. Here’s an article from the Research Methods Knowledge Base on selecting a survey method. There is far more research on best practice on polling, and this is one reason why resourcing using professional pollsters is often a necessity if you want vaguely accurate results, especially on topics that are so controversial. However, none of the research I’ve seen has ever suggested that one should pick out a list of people whose surname “sounds Muslim” and ask them the questions, which is, incredibly, apparently the shortcut Survation used given they didn’t have the time or money to do the detailed and intricate work that would be necessary to generate a statistically representative sample of all British Muslims. Even if the rest of the story had been legit, then – being generous with the free headlines – the Sun would have been more accurate to write “1 in 5 out of the 1500 people we had the time to ring that had “Muslim sounding surnames” and did in fact agree that they were Muslim’s sympathy for jihadis“. But it’s a bit less catchy and even the non-pros might notice something methodologically curious there. that did not even ask the question that would be appropriate to make the claims it is headlining. without providing the necessary comparative or historical perspective to make the results in any way meaningful. that was carried out in inadequate, uncontrolled fashion with no view to producing reliable, generalisable results. We have to acknowledge that, on the whole, people going away to join fighter groups is a bad, sad event and one that the world needs to pay attention to. Infinitely moreso, obviously, if they are travelling to commit atrocities with groups that can be fairly described as evil. But for the Sun imply such dramatic and harmful allegations about a section of the British population to whom prejudice against is already very apparent (note the 300% increase in UK anti-Muslim hate crime last week) to its huge readership – who will now struggle to entirely forget the implication during their dinner-table conversation even if they wanted to – is not only extremely poor quality data analysis, but also downright irresponsible and even dangerous. The intrinsic power of the the chart is highlighted nicely in a recent Harvard Business Review post. In an experiment (*), Aner Tal et al. had a couple of groups read about a new medication that supposedly reduced the incidence of illness by 40%. This was clearly stated in the text the readers were given. The only difference between the two groups was that one of them was reading a document that had a very simple bar chart below it. The chart just showed exactly the same claim; that the incidence of illness went down 40% with this new medication. When they tried to measure, the presence of this chart didn’t seem to increase the understanding or the information retention of the people viewing it in comparison to the other group. However, it did make a difference to what the readers believed. 97% of those who had seen the chart believed the medication would reduce illness, vs just 68% those who had read (and understood) the exact same information, but in purely text form. This is clearly irrational, but shows the impact dataviz can have – even when it technically delivers no new information and does not make the existing information easier to understand. But don’t think rationality will save you! The researchers found that those people who agreed most strongly with “I believe in science” (a strange thing to ask to be fair, but I assume at least somewhat positively associated with those people who consider themselves most rational) saw the largest boost to believing in the medication post-chart. They hypothesise some sort of “I believe in science -> charts mean science -> I believe in whatever the chart says” type halo phenomena. I then wondered what would happen if one popped an entirely irrelevant chart under the article. Would that work as well? Not even delving into the wonderful world of how to lie with charts, but simply present a chart on an entirely different subject. Perhaps one from one of the hilarious faux-science hair product adverts would be a good choice (85% neutrilliam! 5.32948% aquaspheres!). It didn’t seem like the researchers tried that one in the above study, but there is a similiarish study from 2012. No charts involved sadly, but it looked at the impact of putting a totally irrelevant mathematical equation on a document. That they called it “The Nonsense Math Effect” gives a clue as to the results. Here they had groups of highly educated post-grads look at abstracts of two (real) journal papers, one on anthropology and one on sociology. They then had to rate their perception of the quality of the research on a scale from 1 to 100. Both groups read the same abstracts, except one group would see the following sentence added on to the end of the abstract. 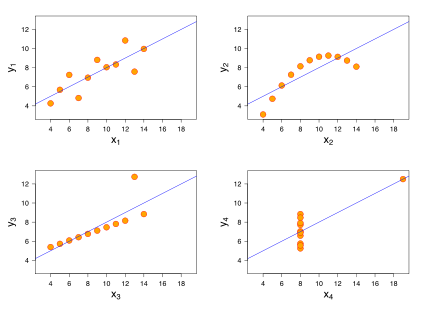 A mathematical model (TPP = T0 − fT0d2f −fTP d2f ) is developed to describe sequential effects. Of course, the net effect was that the group that read the abstracts with this meaningless sentence pasted on at the end rated the quality of the research significantly higher than those that didn’t (**). The research was indeed more highly regarded if a string of contextually meaningless characters that look a bit like complicated maths was written below it. Remember, datavizzers, with great power comes great responsibility. Be sure to never abuse your profession. (*) It’s not listed in the article, but I believe the published article they refer to is this one, although you’ll need a subscription to the “Public Understanding of Science” journal to get to the full paper. (**) When broken down, there was one group of readers who didn’t fall into that trap: those who were experts in maths, science and technology (and those who studied medicine were perhaps not statistically significantly different). Most of the world doesn’t hold post-graduate degrees in mathematics though. Coming up to the election, there’s no shortage of misleading statistics, charts and downright quantitative lies being flung around. One even made it through our letterbox today. It’s far from the worst available online, but such statistical slights always feel more personal when they get physically pushed into one’s abode. Here goes the Liberal Democrats, being honest enough to admit that their main selling point around here is that they got more votes in our area last time than the next largest party did. 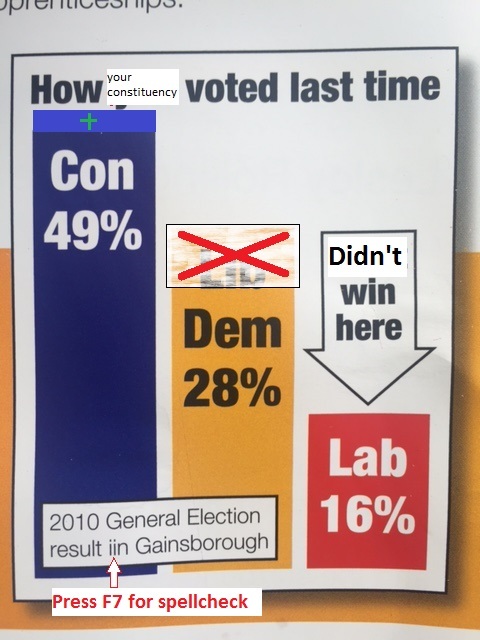 For the avoidance of doubt – my research indicates that 28% is not usually more than twice the amount of 16% on a linear scale, so I have taken the liberty of correcting the chart proportions below for a somewhat more realistic look. Although the point that our constituency is traditionally very Conservative-with-a-big-C remains [sadly] true, the Yougov Nowcast is suggesting a very different result for place #2 at present, as shown here. 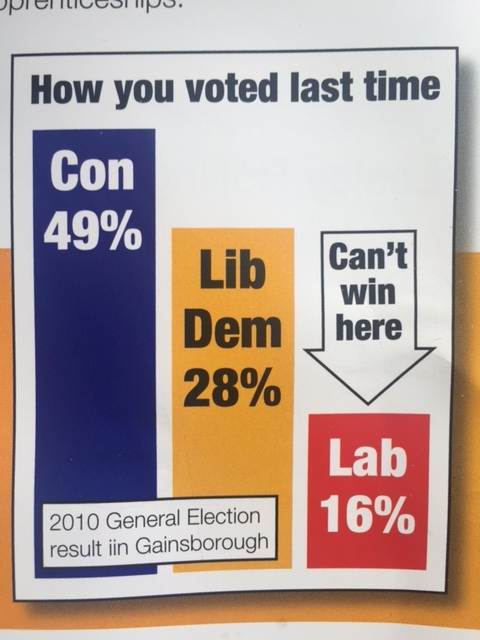 Not that I (or Yougov) would claim that that’s a done deal – but what the Lib Dem leaflet fails to mention is that the last result does not always predict the next result.